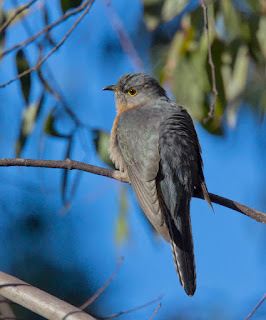 Birds in Tasmania: The First Cuckoo of Winter? Great to see the fan-tailed cuckoo (new to me); great photographic opportunity! Well done Alan. I'd plug for over-winterers. Otherwise, they're very early arrivals back. Thanks for your comments Carole, they're always welcome. There are 4 members of the cuckoo family that are summer migrants to Tasmania. The 'fantail' is the only one that appears to regularly overwinter. However, since in the main, all 4 are more often heard than seen, if they don't call we don't record them! It's always difficult to determine "early" arrivals, and in the main any summer migrant present now has almost certainly "overwintered". This 'fantail'appears to have paired up, not in my experience the norm. The blog was really about a play on the "first cuckoo of spring" theme, and to the idiosyncratic actions of birders. Does it really matter that the cuckoo was photographed in winter! Only, I suspect, to me.